Those sound good enough to moan and groan over. Love pasta and meatballs. on September 24, 2010 at 8:00 pm | Reply Amy H.
I have never heard of raisins in meatballs! HMMMMM. I don’t think I cooked for MYSELF when you lived up here! 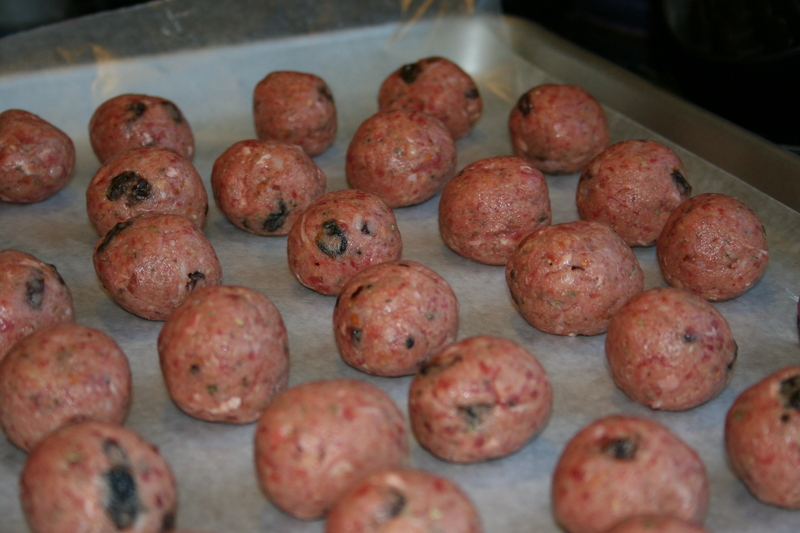 You’ll just have to take my word for it (or Dan’s below…) that raisins in meatballs are THE BEST! Or come visit and I’ll make you some and you can find out for yourself. Hint hint. 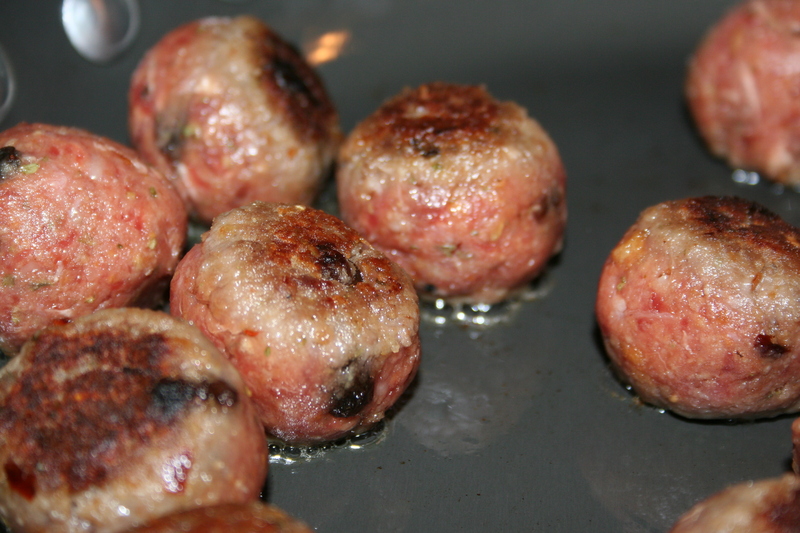 I miss the Farina meatballs with raisins. SO GOOD! I miss them too. Because I’m not eating them RIGHT NOW! 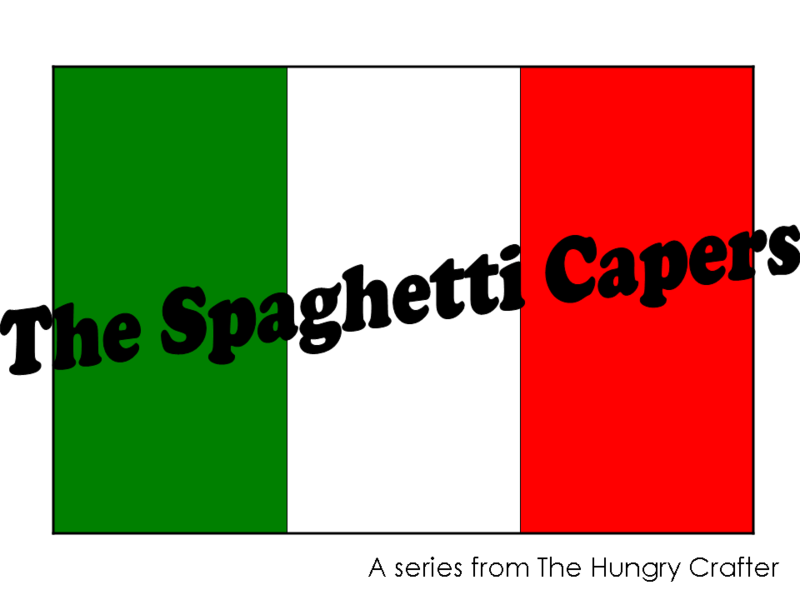 I seriously get hungry whenever I look at this post — it is dangerous! “Remove the parmesan rind(s) with a pair of tongs and discard”? Discard?! Jo, you are missing the best part of the whole production. In my family, we line up and jockey for position to get those coveted rinds! Warm, cheesey, dense and chewy. OMG, save those rinds for me! Back again. I’ve calmed down now. Your meatball recipe is pretty much exactly my family’s meatball recipe, except for the raisins. 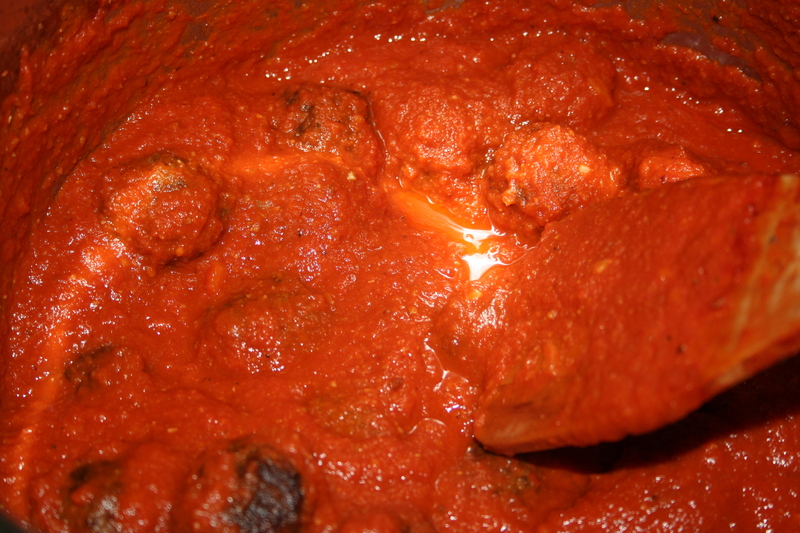 But we do not bother with frying the meatballs; we just gently load them one by one into the vat of sauce, and let them cook in the simmering sauce. 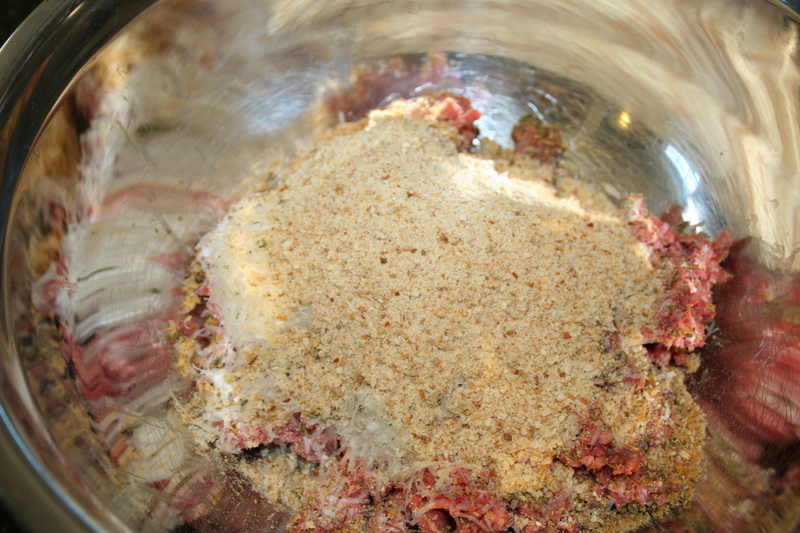 They will firm up as they cook, soaking up the flavor of the sauce and infusing the sauce with their own flavor; the sauce tastes different than when cooked without the meatballs – richer, but gently so (probably from the fats that would have drained off if the meatballs had been sauted). 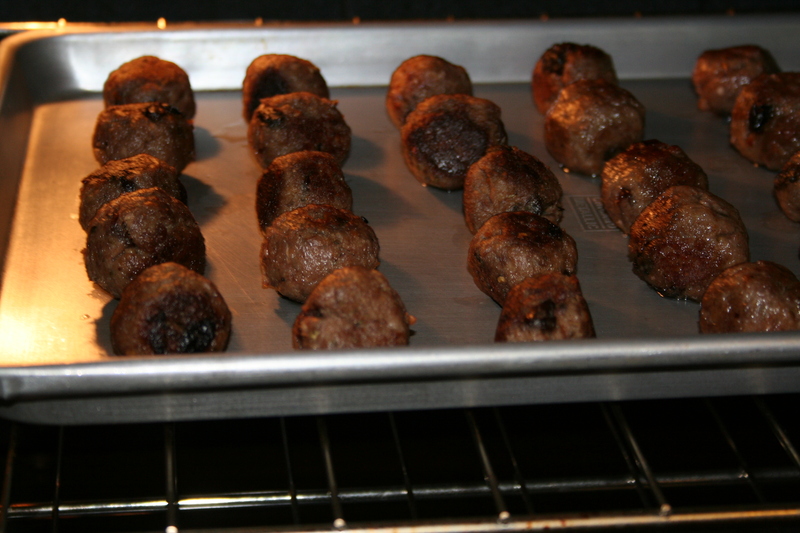 The meatballs will be quite tender and moist, somewhat firm, but easy to fork apart, not crispy on the outside like their fried counterparts (which I realize would be point against them if you are accustomed to fried meatballs; like everything Italian, it’s about what you’re used to). 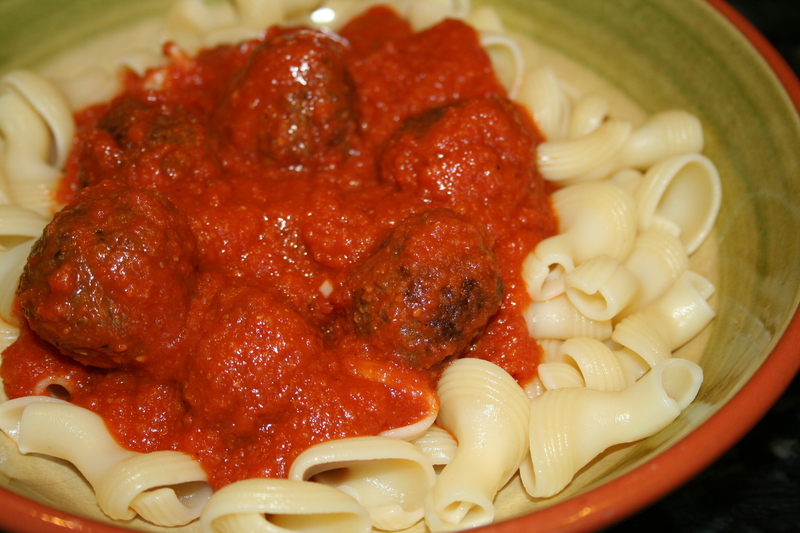 In addition to the flavor, made this way the meatballs are less time and labor intensive, and a little less likely to splash sauce on your shirt because they break apart more easily. And now, I think I’ll go make some!